A total of $60 billion has been erased from the value of all cryptocurrencies over the last week, a decline that has many wondering if the ongoing bear market for the asset class has finally come to an end. 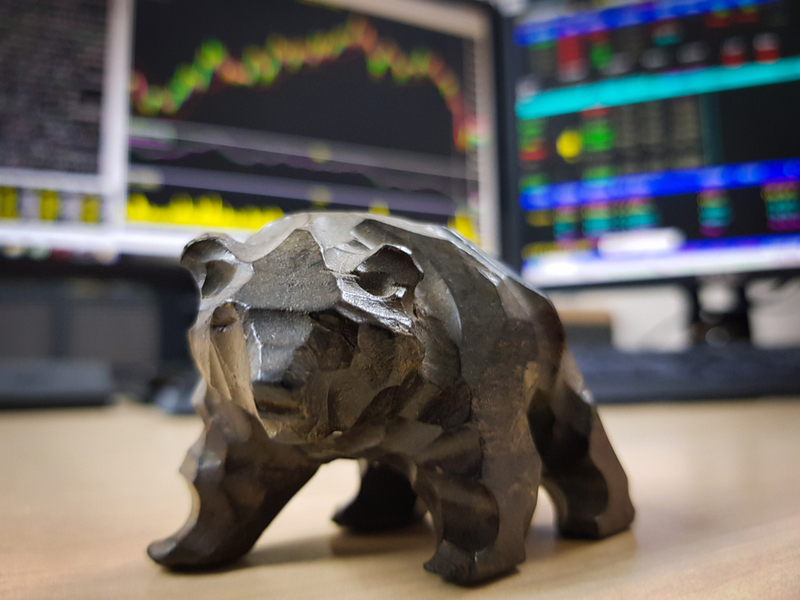 Defined as a period of depressed activity and sentiment, the bear market has seen the price of bitcoin, the world’s largest cryptocurrency, decline more than 75 percent from all-time highs set in January. Further, as bitcoin makes up more than 50 percent of the entire market in terms of total capitalization, it’s safe to say the bear market may end when bitcoin bulls refuse to cede more ground. But in order for a true ‘bottom’ to be found, many figure a “capitulation” needs to take place, since it is traditionally the last stage of a prolonged bear market. By definition, capitulation is characterized by extreme panic selling backed by high volume that builds momentum until an eventual “bottom” is found. The bottom is a price level where the asset looks too cheap or undervalued to investors for them to allow it to fall any further. From 2013-2015, BTC experienced a bear market similar to the one occurring now, in which it reached an all-time high of $1,163 in November, 2013 and eventually fell 86 percent to bottom out at $152 in January, 2015. From that day forward, the price never retreated below $152, according to data from the Bitstamp exchange. If that particular market bottom is an example of true capitulation, it’s clear there are two factors paramount to achieving capitulation: volume climaxes and rapid price declines. 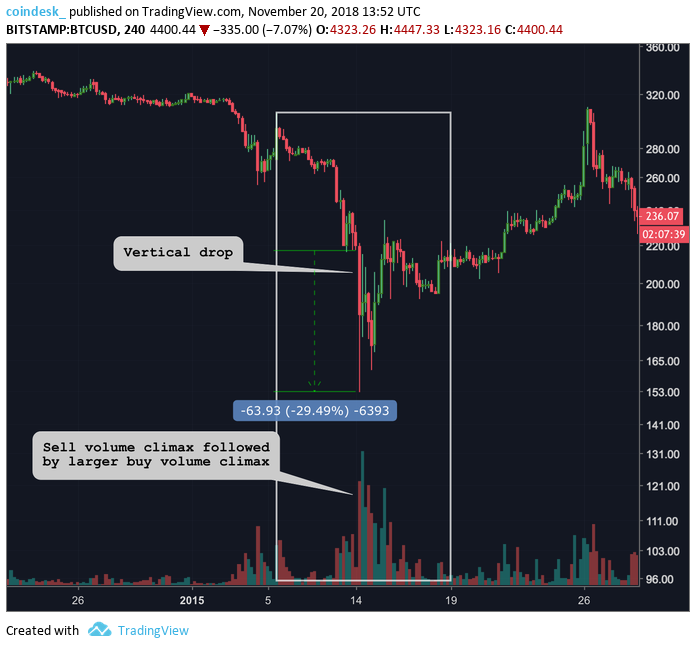 As can be seen in the above chart, the sell-off for BTC began to accelerate at the beginning of 2015, but did not reach an extreme until two weeks later. On Jan. 15, fear and panic in the market reached its peak. 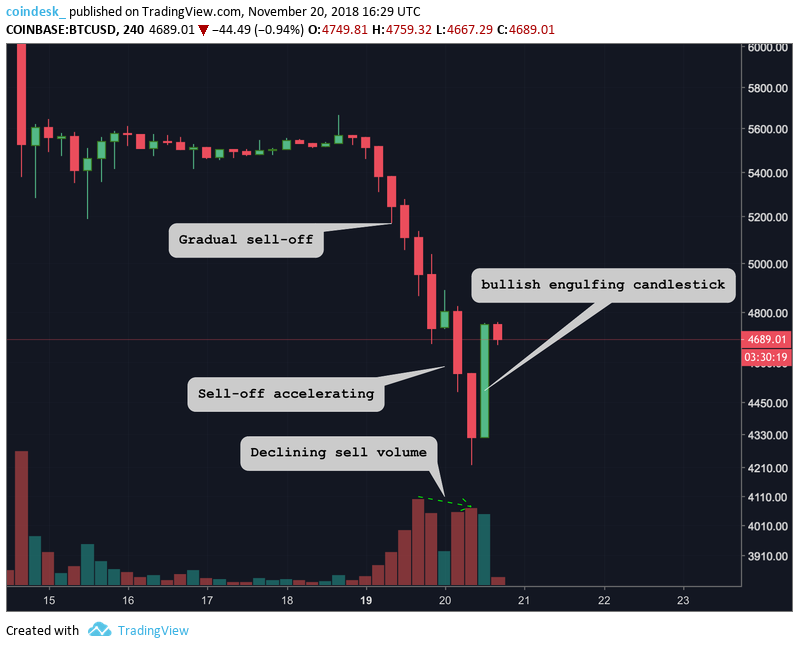 The price of BTC dropped 30 percent in a single 4-hour candlestick that was backed by its most sell volume in several months – an extreme selling event like this creates a volume climax which tends to be the precursor to a market bottom. The sign that likely cemented this point in time as the bottom was what followed the selling climax – even more buy volume. At this point, fear in the market officially met demand and those still interested in BTC considered the $152 price tag too cheap to let it slip any further. As can be seen below, the market is again experiencing a significant sell-off, but so far has been more gradual than the capitulation experienced in 2015. 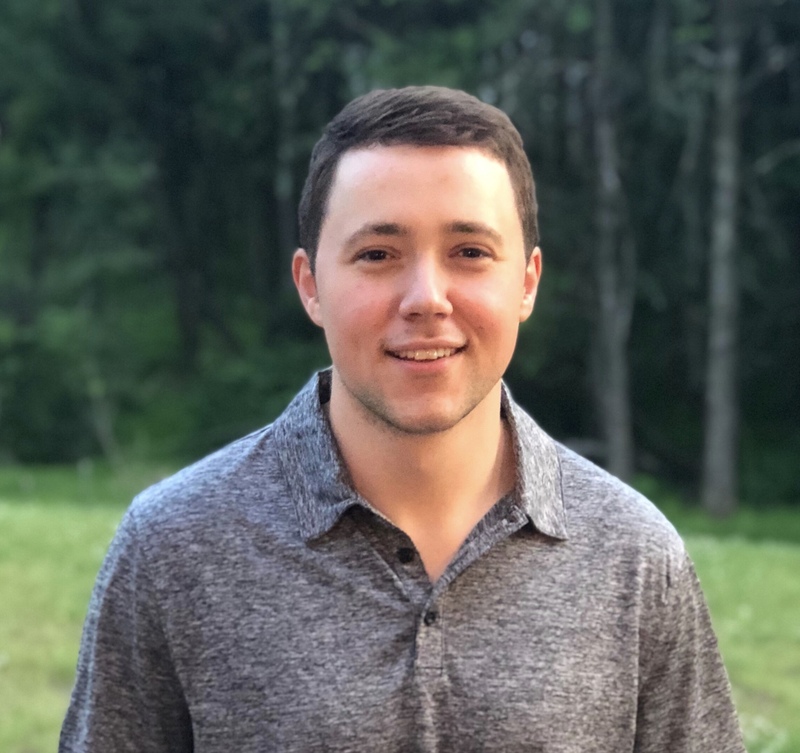 This is evident in that no single 4-hour candlestick has recorded more than a 9 percent loss whereas the single “market bottoming” four-hour candlestick in 2015 recorded a 30 percent loss. That said, sell volume has clearly picked up pace over the last couple of days and the current four-hour chart is showing promising signs for an “at least temporary” bottom. As can be seen in the above chart, sell volume is beginning to lessen and diverge from the falling price, a sign sell orders are drying up. What’s more, the last four-hour candle just bullishly engulfed the prior candlestick with a notable uptick in buying volume. A candle is considered to be ‘bullish engulfing’ when its body completely covers that of the prior candle, these types of candle tend to form at the bottom of downtrends but are more powerful the higher the timeframe. Should be noted, capitulation events do not immediately reverse the long-term trend of a market. After BTC bottomed out in Jan. 2015, it largely traveled sideways for another 10 months before beginning a new uptrend toward the end of the year. Such extreme selling events are also very rare, so it’s unlikely for the exact market conditions of 2015 to be replicated this time around. It’s safe to say though when true capitulation occurs, you’ll know.